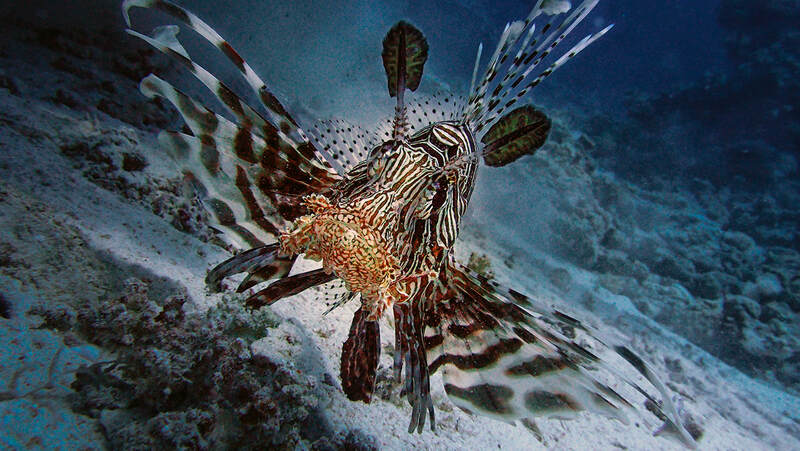 ​This is the name given to the Reefs along the shore of the main resorts of Sharm El Sheikh. From the Start of the Straights of Tiran to the Old Town Market of Sharm. 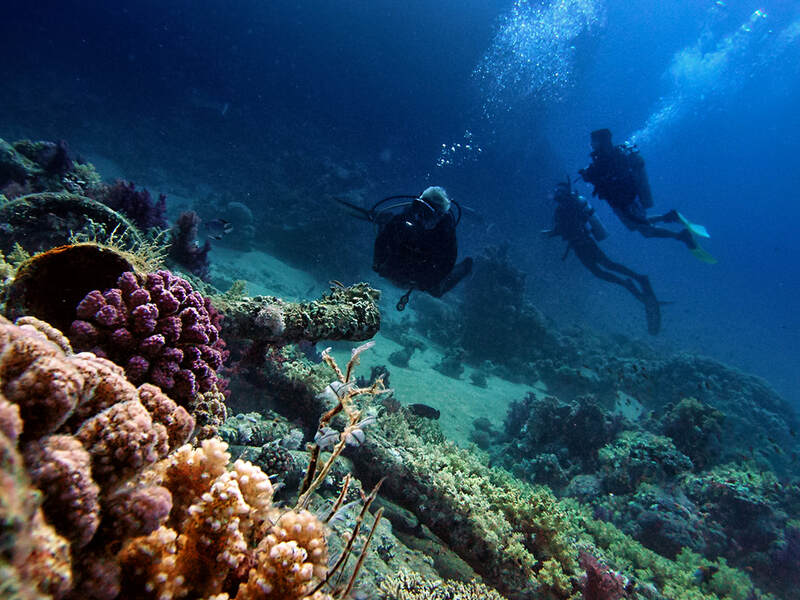 Some of these dive sites are suitable for beginner courses and shake down dives (refresher or re- familiarisation dives), while some are more suited for the more experienced diver such as Ras Um Sid and Ras Nasrani where you can sometimes find yourself in fast currents to drift along with. This area is the channel that lies between the Sinai coast on the North end of Sharm El Sheikh and the Island of Tiran. 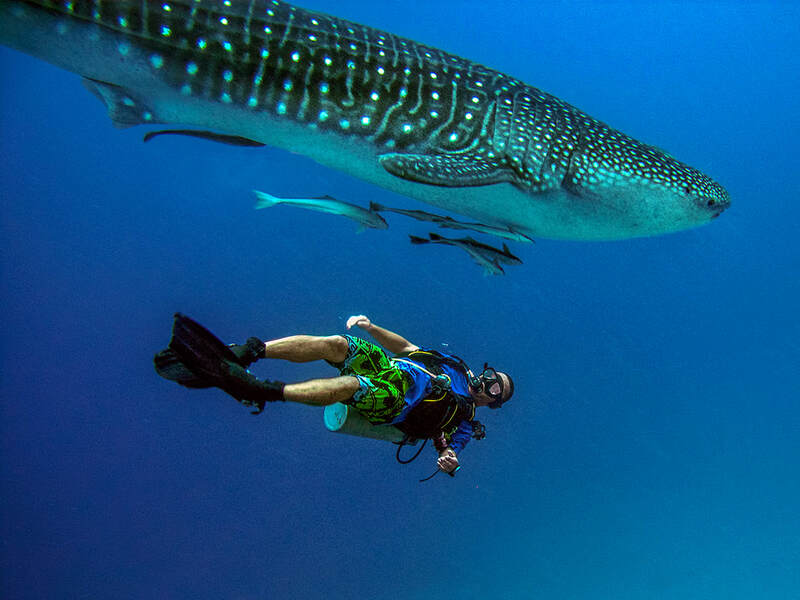 Along with many other dive sites, here you can find four coral reefs that span the sound and offer some of the most exhilarating and spectacular diving in the world. The reefs were named after four British cartographers who were the first to survey the area in the 19th century, to produce a nautical map of this region. Messer’s Gordon, Thomas, Woodhouse and Jackson. Thomas reef is popular with the Technical divers for its deep canyon. For the recreational diver, Jackson reef is often referred to as the jewel in the crown with its “stunning coral garden” on each extremity. These areas are commonly called the “garden” or “aquarium”. A must for any diver who visits this area. “Rasmo” as it’s locally referred to, is one of Egypt’s National Parks and the only one that has its boundaries extended into the sea. It is situated on the most Southern tip of The Sinai Peninsula. Again there are many dive sites within this area. Among people’s favourites are the scenic drift along Ras Ghozlani and Jack Fish Alley.The topography of this area is quite different to the straits of Tiran and the mainland local reefs, with spectacular sheer drop offs on several of the sites. Renowned to be in the top ten dive sites of the world The currents at Shark and Yolanda reefs can be very strong and that brings with it large amounts of plankton and other food which in turn climbs up the food chain to attract the concentration of massive shoals of Jacks, snapper, barracuda, bat fish, unicorn, tuna. With this large concentration of fish you can regularly catch sight of the larger shark that prey on these fish between June and August around Shark and Yolanda reefs. 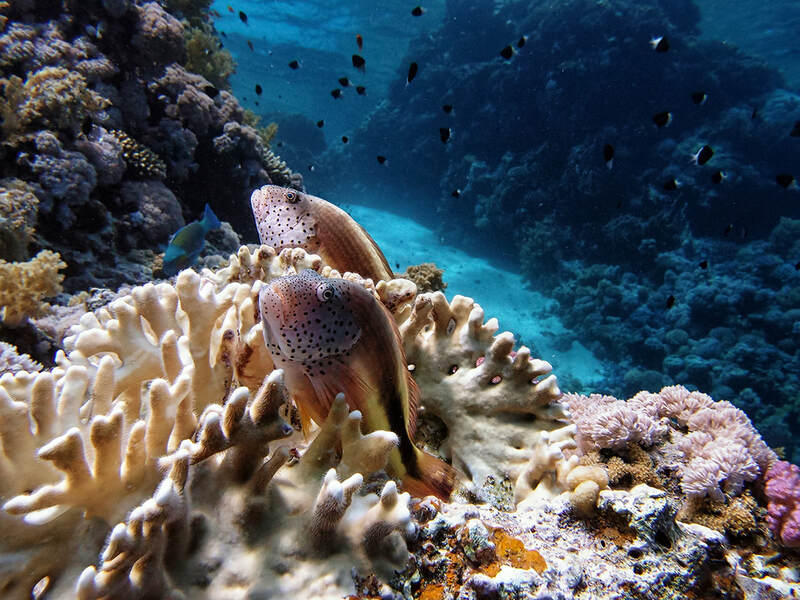 ​This a series of reefs extend on the western coast of South Sinai. The full extent of this reef does not normally get explored by a day boat but more often from a Liveaboard Safari. Often visited by day boats is the nearest point of the reef from Sharm named Beacon Rock where lies the wreck of the British merchant ship Dunraven. Built in Newcastle in 1873, it sunk 22 April 1876. It lies close to the reef wall and slopes down to 29 .5 meters on the sandy bottom. It was only discovered by accident in 1977 by geologist Arye Keller and underwater cameraman Howard Rosenstein. THE DUNRAVEN was featured by the BBC in a 1977 dramatised documentary and told the story of it’s last voyage. A very popular wreck site with a spectacular coral garden at 8 to 5 meters on the southern end of the reef to finish the dive. ​Again normally explored extensively on a Safari boat but many day boats leave Sharm very early in the morning to venture this far for one reason and one reason only. 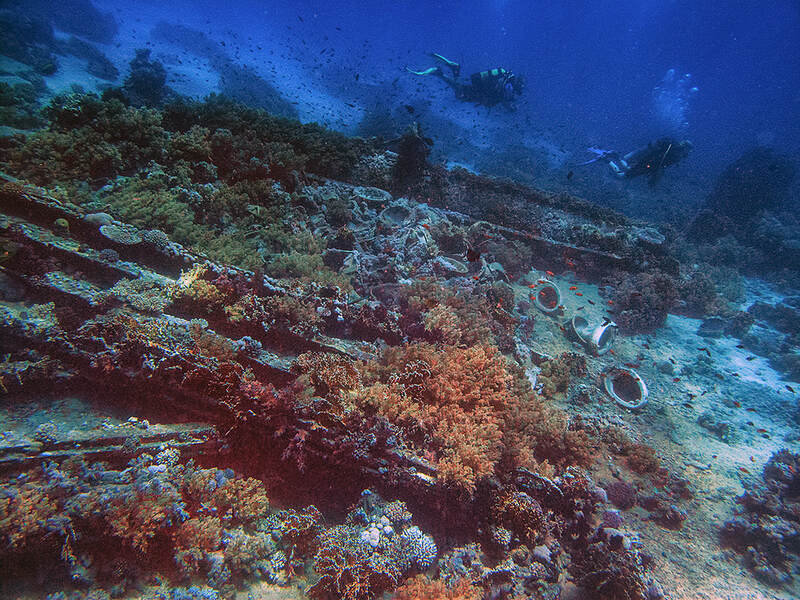 Truly among the elite wreck dives in the world. This World War 11 British merchant ship sank on 6th October 1941 after being attacked and bombed by two enemy aeroplanes, while lying in anchorage awaiting safe passage to re stock the British army with riffles, ammunition, trucks, motorbikes and much more. 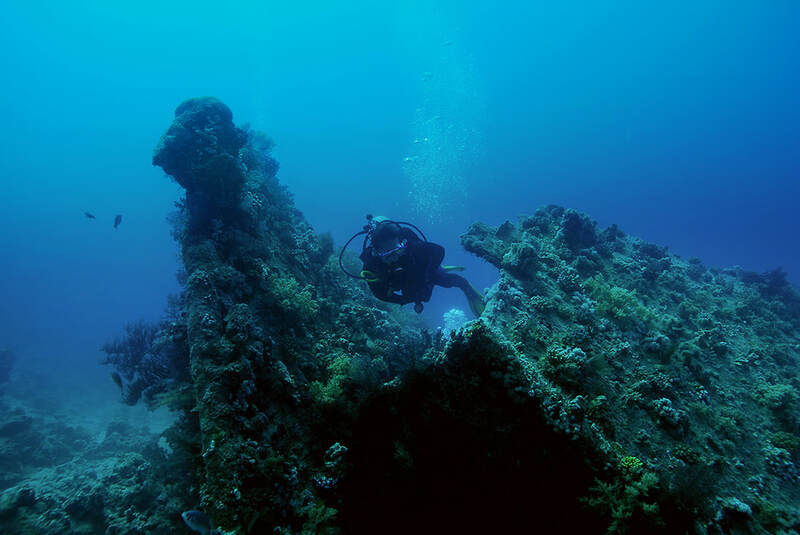 Most of which can still be seen when diving the holds and blast area of this truly great wreck. It was a very violent explosion and the ship was torn in two. The stern section listing approx 45 degrees to the Port but most of the ship is upright on the sea bed and the highest point lies 11 meters from the surface and drops down to the flat sea bed at 30 meters below. This must be in every divers to do list. ​Dahab Is a quiet Bedouin resort that is approx 90 kilometres north of Sharm and for the frequent diver to Sharm is a pleasant change to take a day trip to dive the famous shore based sites like the Canyon or Blue Hole. The Canyon is situated 10 kilometres North of Dahab town. The dive site is reached by wading from the shore into a small blue lagoon that opens up into the open sea. You then swim approx 50 meters to the north to find what is basically a crack in the sea bed. There is a large entrance where you enter at 22 meters and drop down through the canyon to the sea bed at 28 meters. Here you can wonder at the structure of the canyon walls that tower around you and the spectacular effect of the sun’s rays entering into the canyon. When you follow the bottom to a shallower depth you find the start of a vertical chimney (cave) where you swim into and if you can hover motionless you’ll be surrounded by hundreds of dusky sweepers. Beware, there are lion fish taking refuge in the cave in the day, so take care and keep you hands to yourself while ascending slowly towards the opening at the top. On exiting the chimney, if you look back down the reef you’ll see a curtain of bubbles coming out of the reef as your expelled air has taken it’s time seeping through the reef and up towards the surface. Now it should be time to head back to the entrance of the lagoon taking in the coral garden at the foot of the outer reef as you go. ​This lies 1.5 kilometres north of The Canyon. The Blue hole is best described as a underwater volcano crater as that’s what it looks like. 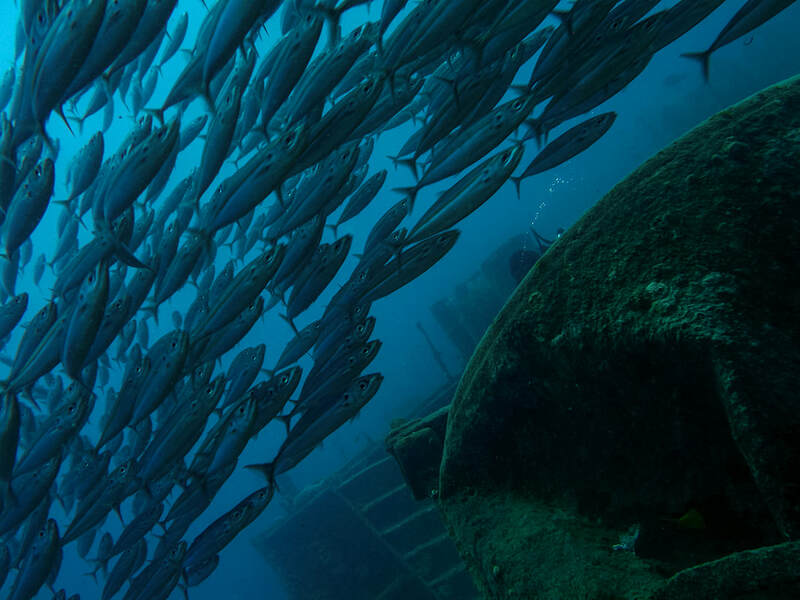 Not that interesting unless you’re a technical diver as it drops to a depth of 110 meters where at 52 meters starts an tunnel 22 meters long that carries on to the open sea through the outer reef. For the recreational diver, it’s far more exiting entering the water at Ells Bells which is a crack in the reef wall 200 meters north of the blue hole, drop down the vertical chimney where you can see out to the blue all the way down to the end of the chimney at 26 meters, then along the vertical wall that’s teaming with life, and watch the cornet fish use your bubbles as they ascend, to hide behind as they creep up on some unsuspecting reef fish to pounce on. 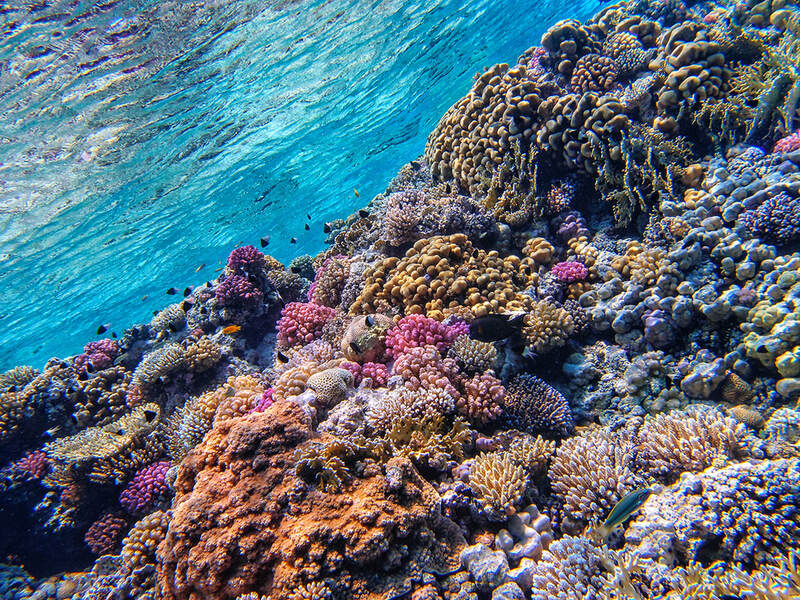 By following the reef wall you come across a sloping coral garden which is the entrance into the blue hole at the outer reef at about 7 meters. As you swim over this garden you all of a sudden see the bottom drop away from you as you enter the inner crater of the Blue Hole. A must for all adrenaline junkies. You can either swim across the blue void to exit at the shore end of the blue hole or swim around its edge at 5 meters doing your safety stop on your way round to the exit point.